Why Do Successful Real Estate Agents Join Lake Homes Realty? The nation’s largest lake-focused real estate brokerage is also one of the fastest growing (and ranked #927 on the 2017 Inc. 5000). And for very good reasons! Really, How Different Can a Brokerage Be? Real estate sales remain best facilitated by expert agents, local to each lake market. The best agents understand the advantage of a truly unique market differentiation in the unique lake real estate marketplace. 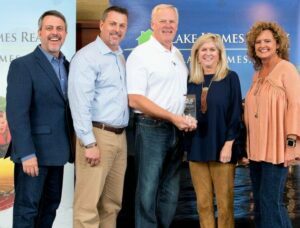 Lake Homes Realty agents reap the benefits of millions of dollars of advertising and technology built specifically to serve lake home buyers and sellers… and the agents who specialize in this market. We are THE SPECIALIST in the place lake buyers come from (the web). The best and dominant tool for buying and selling lake homes. The only real estate brokerage 100% focused on lake real estate. Exclusive access to high quality, No-Fee leads powered by our own LakeHomes.com. Regular opportunities to learn from best-in-the-business colleagues from other lakes across the country. Looking for a Unique Market Advantage? We are building a national organization and would love to hear from interested, producing lake-focused agents from any state. If you don’t see your state on this list but have interest in learning more, please reach out to us! We may still find we have a mutual opportunity! In confidence, please request more information, or give us a call at 1-866-525-3466. Or email your contact information, including your city and state, and the lakes you are knowledgeable about, to us at agents@lakehomes.com. Lake Homes Realty really is THE Specialist in THE Place buyers come from (The Internet). And sellers want to be where the buyers are! Our brand, systems, operations, marketing, and technology are all focused on making our agents THE most successful agents in their market. Lake Homes Realty is a licensed real estate brokerage in Alabama, Arkansas, Connecticut, Florida, Georgia, Louisiana, Maine, Maryland, Minnesota, North Carolina, New York, Oklahoma, Pennsylvania, South Carolina, Tennessee, Texas, Virginia, and Wisconsin (with additional states coming soon).